When I met my husband some years ago (before Quicken), I was surprised to discover that he balanced his checkbook by rounding. He would enter “$50” if he thought he had spent about that, and figured he would be safe from overdrafts if he always rounded up his entries. But I, being rule-bound, made a great effort to keep my checkbook accurate to the cent. These two tactics seemed like case studies on our different personality types, and I, of course, considered my approach superior. It took me years (and the advent of Quicken and online banking) to turn-over bill-paying to him. 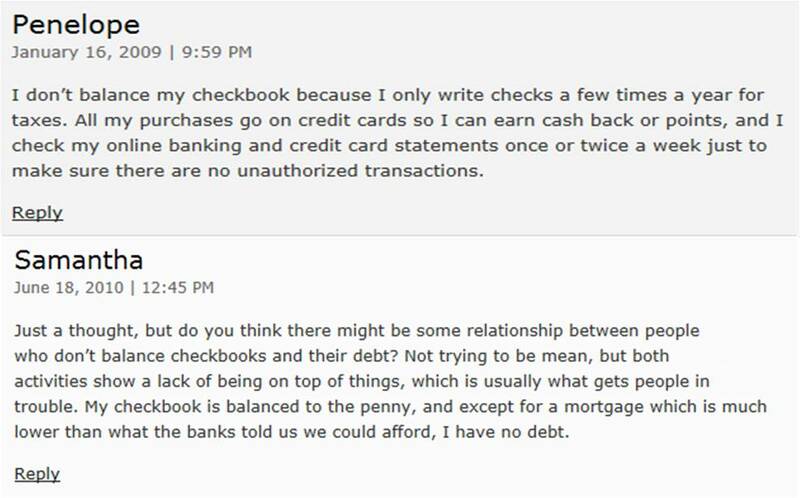 Now I find his early checkbook balancing tactics are increasingly popular with young adults. This triggers the same kind of question I had years ago, “Is mobile checkbook balancing trendy and smart, or naive and lazy?” I guess the answer is still the same… it depends on your personality type. In his Money Relationship blog, author Adam writes, ” Personally, I have never really balanced my checkbook…For the past several years, I have used Quicken on a daily basis. It automatically gets my transactions for me and I don’t have to worry about writing them down…. My fiancé still religiously balances her checkbook. I always see her doing it every week and it makes me cringe every time. She is always like 1 cent off somewhere and she goes nuts trying to find that penny.” So the coin flips both ways! If you’re not sure, just look at the range of comments to his blog – from nonchalant to uptight. Like much else in life, money management styles are a personality thing. This entry was posted in Customer Behavior, Customer Experience, Financial Services and tagged Customer Behavior, Customer Experience, Financial Services. Bookmark the permalink. This is one of your best! Keep up the great work! Very insightful, as usual!